Starting this new year we have been thinking back on how lucky we were last year to have the wonderful opportunity to go on our big trip. It was a great experience, and we were touched by how many of you have followed along and told us how much you enjoyed our accounts of it. We still have about a month of the trip to post, so we'll be working on that as soon as we can, but we thought we'd put together a fact and FAQ post to answer some of the questions we been asked the most to tide you over. Thanks for reading along, and we hope you continue to share our adventures with us for the year to come! We visited 12 countries: United Kingdom, France, Switzerland, Germany, Austria, Hungary, Czech Republic, Poland, Italy, Morocco, Spain, and Sweden. We left on August 12, 2012 and returned on November 9, 2012, a total of 90 days! Which places did you like the most? Both Laura and I loved Gimmewald, Switzerland. The scenery was extraordinary and we really enjoyed hiking on the well-marked and well maintained trails. We both agree that Gimmelwald was our favorite, but in second place, we disagree. Laura liked London and Pienza, Italy, whereas, I preferred Morocco (I particularly enjoyed learning about a different culture and I enjoyed our trip to the desert). We stayed in hotels, hostels, airbnb, and with family. If you've never used airbnb before, we highly recommend it. Airbnb is a site that connects travelers and hosts across the world. Anyone with an extra bedroom (or couch) can become a host by posting their room on the site. We stayed in a number of airbnb places where we got the entire apartment to ourselves and also a couple where we just had a room in the host's house. Having the place to yourself is nice, but it's also nice to get to know some of the locals. In bologna, our host taught us how to make pasta! Planes, trains and automobiles, ferries, buses and many many kilometres of walking. We flew to and from London, as well as taking discount flights from Warsaw to Rome, Bologna to Casablanca, Barcelona to Stockholm and Stockholm to London. Europe has some really good discount airlines; We used Wizz air, Jet4you and Ryan Air. We spent most of our time travelling between cities by train. We got a Eurail Global pass which allowed us to travel whenever and wherever we wanted in Europe for a month. We took a total of 25 train trips in that month taking us from Paris all the way to Warsaw. To travel around Spain, we ended up renting a smart car. It was a lot of fun and we got to see different things than we would have by train. We ended up driving 2576km throughout Spain and Southern France. On a daily basis we walked mostly everywhere. We did take advantage of the metro/subway systems in London, Paris and Budapest when we wanted to go farther or get around quicker. How many languages did you have to decipher? We encountered a total of 14 different languages throughout our travels. English, French, Swiss German, German, Czech, Hungarian, Polish, Italian, Arabic, Berber, Spanish, Basque, Catalan and Swedish. Our french helped us out the most, working in France, Switzerland and Morocco. How many currencies did you have to exchange your money into? You'd think that the Euro would mean that we hardly had any different types of money, but we handled a surprising 8 types of currencies still! 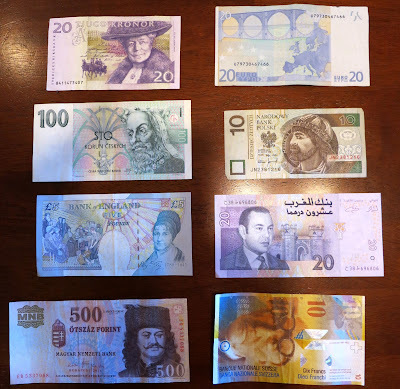 British Pounds, Euros, Swiss Francs, Czech korunas, Hungarian forints, Polish złoty, Moroccan dirham and Swedish Krona. How much stuff did you bring for 3 months? We travelled surprisingly light. At the start of our trip our bags each weighed only 10kg (22lbs) each. They weighed it at 13.9kg (30lbs) and 16.5kg (36lbs) each at the airport on the way home. We had a very strict packing list, and things had to have a very good reason to make it onto the list. I definitely vouch for airbnb as well - they really are the best and I found that they tend to be cheaper that hotels, especially in desirable areas in bigger cities. Very cool that you visited (and kept track of) so many World Heritage Sights. Also, I really can't believe how light you guys packed...even at the end of your trip, with rug and all. You guys are amazing. I also would like to see your packing list. Don't worry, a post about our packing list is in the works. I would like to know how the 12L divides between JAM and LAM.